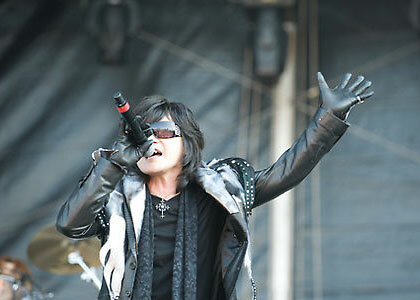 X Japan Finally Play in U.S. 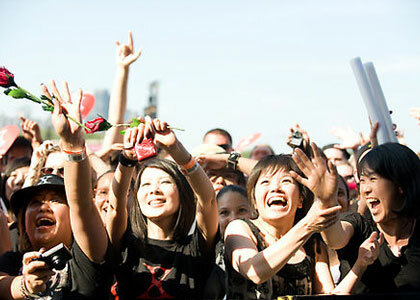 The front rows of the audience were dominated by Japanese faces, some with the elaborate fashion, makeup and hair that X Japan and their fans established as the dress code of visual kei rock. And unlike many of the locals, they certainly didn’t need any encouragement to sing along or make the traditional X symbol with their forearms. Many were reduced to tears, especially when slow motion images of the band’s late guitarist Hide were projected on a screen during an interval. X Japan return home for two shows at the Yokohama Nissan Stadium next week, before returning to the U.S. for a full North American concert tour. The tour was scheduled to start in October but the date for the opening show has been announced as September 25 in Los Angeles, where drummer and band leader Yoshiki is based. Plans to go on a European tour from January were also revealed yesterday.